Ever wonder how the top Android apps manage to gain and retain superiority? Of course, there is no simple answer and the recipe for success is often extensive and convoluted. We won't argue that brand awareness plays a major role, or that a nice feature set can give you an edge over the competition, but a new analysis on data collected from 125 million Android phones and Google Play reveals a rather interesting pattern and hints that the first few days in an app's life cycle are far more important than a lot of you may think. 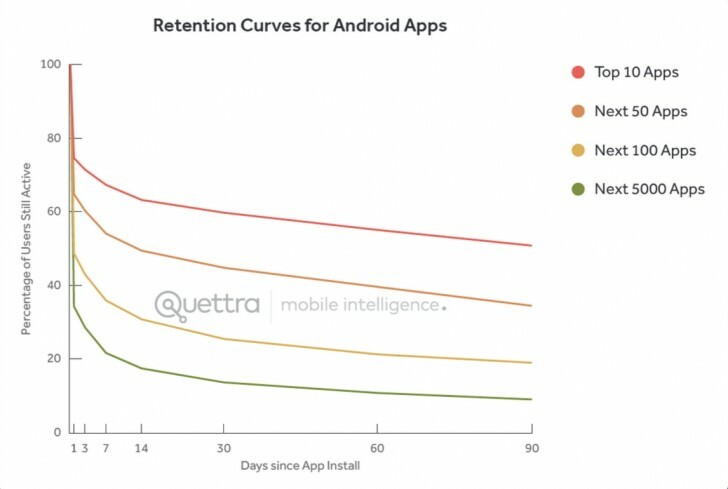 Andrew Chen, along with Ankit Jain - CEO of a mobile intelligence startup called "Quettra" are responsible for the analysis and their findings seem to show that it's quite likely for an Android app to lose about as much as 80% of all its users within a month of the initial app install. The fact is that most Android users tend to shop around quite a bit for their apps, which usually means installing a bunch of alternatives, giving them a quick try and then possibly moving on to the next. 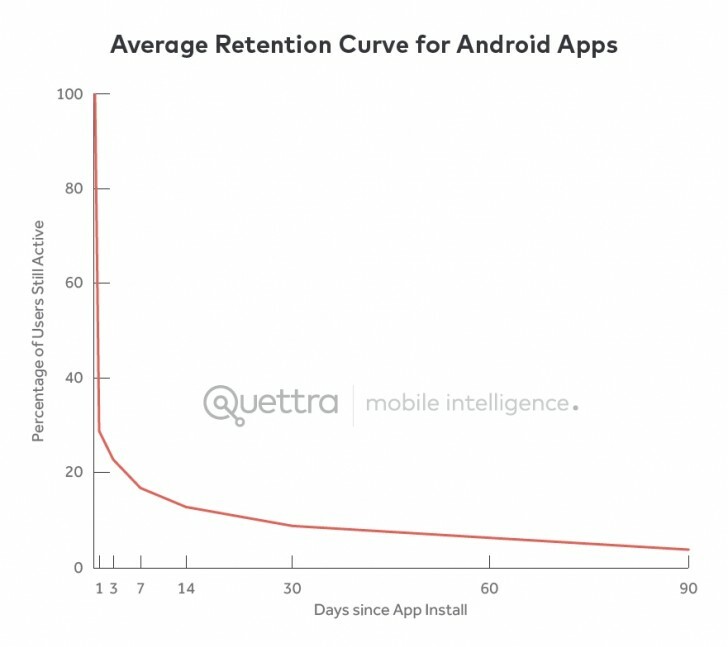 This is why, as evident by the graph, as much as 75% of users typically leave the app on the same day they install it and at the end of the first week, that number is usually over 80%. Now, one could argue that this is just because the average metric is distorted by the sea of objectively bad apps out there in the Android realm, but, interestingly enough, when they moved on to analize just the very top performing applications, Andrew Chen, and Ankit Jain stumbled upon a quite similar user retention pattern. The general timing seems to be the same and large drops tend to coincide, the only real difference being that the most popular apps have managed to lower the percent of losses significantly. What this translates to is developing experiences that are engaging at first sight. Some examples might include, giving the user a big bonus at the beginning of a game and a daily incentive to come back for more rewards, or perhaps in a more social or communications app - get them invested in the platform straight away, by guiding them through a profile creation wizard and linking them with current users and friends. These tactics may vary, but if you were wondering why your mobile app isn't doing all that well, despite your endless efforts to add in new features, it might be time to invest more in a catchy description, some Google play multimedia content and a good retention scheme for first time adopters. Do not insult the paranoid. A paranoid person would read each EULA. Someone who just taps "Accept" on any conditions and then complains about lack of rights is just stupid. Then you obviously haven't read the 'Terms and Conditions' either.